Sharukh Doesnot like to miss his train- Chennai Express | GSV Films :: Film news, video songs, movies news telugu, tamil hot actress. 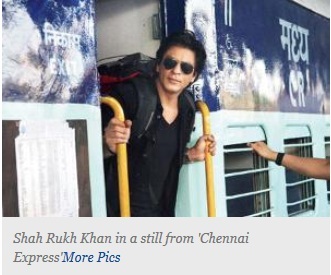 Its has been a sentiment for the bollywood film makers showing trains with SRK to get success. Now in Chennai Express the trend and sentiment follows.. Romance is not the only constant in a Shah Rukh Khan film. The trailer of 'Chennai Express' is a reminder of how the train and backpack are equally integral to his films. We take a look at several of his movies that feature the train, the backpack or many a times both.